Pennant Flags add a celebratory atmosphere to your grand opening event! Install this item to create an instant fiesta, carnival or circus themed party look. 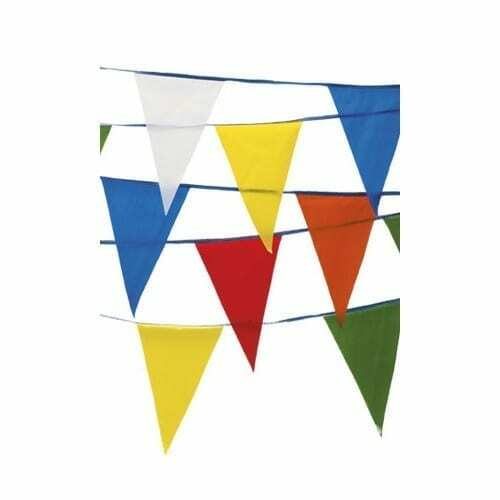 The pennants are an easy way to add color and expand the feeling of the space. They are easy to install or you can request to have our staff install them for you (labor not included in pricing). These colorful flags are perfect for a Fiesta Wedding themes. Check out our other Fiesta Party Rentals by clicking here. Likewise, we offer simple white flags that are made out of cotton and subdued silver ribbon that are perfect for weddings or to create a ritualistic prayer flag look at your event. Check out the white flags installed at The Mansion Wedding. For more details about the White Flags rental click here.